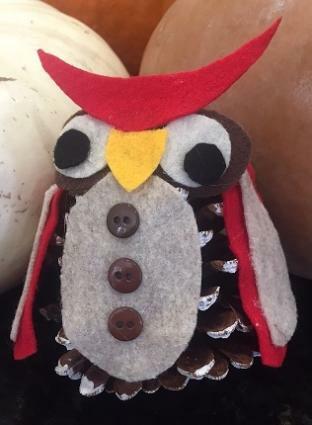 Creating crafts with pinecones is not only fun, it's also an environmentally friendly activity. In many cases you can find pinecones in your neighborhood, which means you don't have to shell out a lot of money for your materials. These pinecone projects are perfect for holiday and winter activities, but can also be fun to create throughout the year. 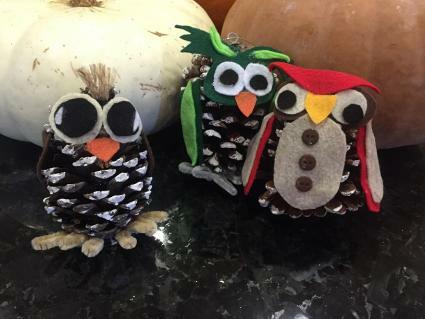 Depending on your color scheme and the size of the pinecones you use, these owls can be used as decorations year round. They can hang on your Christmas tree, be part of a holiday centerpiece, or could even be made with a red, white and blue color scheme for an Independence Day table. You can place your pinecone stem side up or stem side down. If you choose to stand it stem side down, you may need to need to clip the stem with heavy utility scissors or garden clippers so that your owl will sit flat. Cut shapes for eyes and a beak from felt or foam. You can layer colors for the eyes, such a white circle with a smaller black circle in the middle, if you wish. Glue the features onto your pinecone. Cut circles, ovals, or half ovals out of felt or foam for the owl's belly and wings. If you are not confident about cutting or drawing these shapes freehand, you can use a drawing or paint program on your computer to draw circles and ovals of various sizes. Then print the shapes for use as patterns. You can also purchase plastic templates for circles and ovals. Glue belly and wings to the pinecone. Add buttons, large sequins, or other embellishments to your owl as desired to create feet, accessories, and other details. If you want the owl to have horns, glue on shapes from your felt or foam, use tufts of twine or yarn, or use real feathers. If you plan to hang your owl, add ribbon, string, twine or wire near the top of the head. Secure it by tying or gluing it to the pinecone. Allow the glue to dry completely before displaying or hanging. While wreaths are most popular at Christmas, they can be used as a door or mantle decoration during any season. This rustic design is perfect for fall and winter. Add gold, silver, or white pinecones, some ornaments, and glittery ribbon to turn it into a Christmas wreath. Place the wreath on a flat surface. Select a variety of nice looking pinecones of various sizes and colors and arrange them on the wreath until you are satisfied with the design. Glue each pinecone in place with hot glue. Tie a large bow from the burlap ribbon and glue it to the top of the wreath. Depending on the elements you select, you can create napkin rings suitable for an autumn event such as Thanksgiving, or elegant, sparkly napkin rings perfect for Christmas dinner. If you want to paint the pinecones before you use them, spray paint or dip them in paint at least one day before you will use them to allow time for the paint to dry. Alternatively you can purchase painted pinecones from your local craft store. Painted pinecones are usually available in white, gold, and silver and may be coated with glitter. 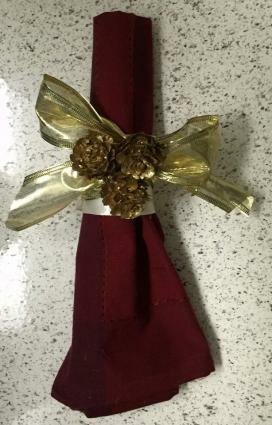 Select a wide ribbon or burlap strip that will be the basis for your napkin ring design. Cut the cardboard tubing so that it is about half an inch shorter than the width of the ribbon or burlap. If you are using burlap strips, cut enough burlap to cover the tube with a small overlap. Apply glue at intervals on the burlap and then wrap it around the tube. Glue the overlapping ends over the ends of the tube and adhere them well so that they will not fray. If you are using wired ribbon, cut enough ribbon so that you can tie it in a bow after you wrap it around the tube. Mark the length of the circumference of the tube on the ribbon and apply dots of glue to the back of the ribbon, leaving the ends free so that you can tie a bow. Carefully wrap the ribbon around the tube, assuring that it is secure, and tie the bow. Glue pinecones in an appealing arrangement to the center of the burlap strip or ribbon bow. Add other embellishments if desired. If you use white glue for this project, let it dry for a full day before using the napkin rings. Repeat these steps for each napkin ring so that you have enough for your table setting. These little trees can make nice table decorations on their own or as part of a centerpiece. Prepare the clay pot by sanding with fine sandpaper and then wiping dust off with a damp paper towel or very soft cloth. Paint the pot with acrylic paint if desired and let it dry for several hours. You may need a second coat of paint, so it is a good idea to paint the pot at least 24 hours before you want to complete this craft. Apply glue around the inside of the top edge of the flower pot. Place a pinecone, pointed side up, in the pot and press down gently to ensure that the glue will hold it in place. If you like, you can embellish the pot with a painted design in a contrasting color, tie a ribbon around the top of the pot, or apply washi tape around the top or the base. Note: Using small pinecones and tiny flower pots, you can easily turn this project into place card holders. Paint the pots with chalkboard paint so that you can write a name on them for each place setting. This bird feeder can be used year round, but it is especially nice in the winter because it provides extra fat and calories birds need during cold weather. If you are making these feeders with a group of children, ensure that none of the children have a peanut butter allergy. Suet can be substituted for the peanut butter if that is a concern. You can usually get suet (beef fat) from your local butcher. Select a pinecone that is fully open. You will need at least a quarter of an inch of space between tines. Tie a sturdy loop of string around the top of the pinecone so you can hang it. Starting next to the pinecone's spine and working outward, fill the area between tines with peanut butter. If using suet, you may need to heat it slightly so that it softens and becomes more malleable. Avoid suet during warm months because birds will not eat it then. Also, suet deteriorates quickly in hot weather, becoming smelly and rancid. Once you've filled the pinecone almost to the end of the tines with peanut butter, roll it in birdseed or unsalted, unroasted sunflower seeds. Hang the finished feeder outside for birds to enjoy. 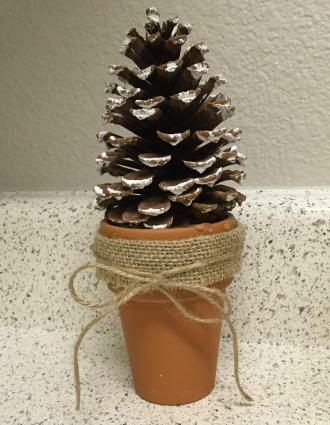 Crafts using pinecones can make great gifts, such as this pinecone room deodorizer. This craft works better with smaller pinecones, which you can then place in a bowl for a pretty and functional gift. 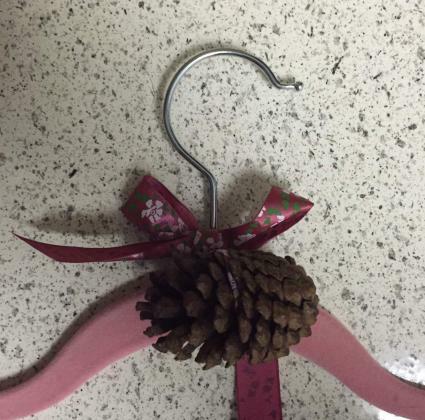 Alternatively, you can tie the finished pinecones to decorative coat hangers to make pretty closet deodorizers. Select a half dozen small cones and soak them for two days in a solution of 25 drops of cinnamon leaf essential oil and four cups of hot water. After the pinecones have soaked sufficiently, let them dry overnight. Cure them in the oven for two hours at 175 degrees. If they are not completely dry after two hours, leave them in the oven until they dry, but continue to check on them at 15-minute intervals to make sure that they don't get too dry and brittle. Allow the pinecones to cool. Tie a ribbon bow at the top of each pinecone for a decorative touch. If you are using the coat hangers, add extra ribbon to each pinecone so that you can tie it around the neck of the hanger. The best place to find pinecones is in your own back yard or in a public park near you. Try to choose pinecones that don't have needles or visible sap. Wash them in plain water, then spread them on cookie sheets lined with aluminum foil. Heat for 45 minutes at 200 degrees Fahrenheit. This dries them safely and kills any bugs that might be lurking inside. Heating also melts excess sap. Be careful not to touch the pinecones while they are still hot; any hot sap that touches your skin can cause a painful burn and will be hard to remove from your skin. Let the pinecones cool completely before using them. If you live in an area where pine trees are scarce or unavailable, most craft stores have pinecones for sale in their floral departments. If you have to purchase them, avoid the pre-scented ones. They may resist glue and you may find the scent strong or unpleasant, especially if a seasonal scent has been used. Pinecone crafts feature natural and easily available materials, which add a rustic touch that can be enjoyed any time of the year. You just need to apply a little creativity to turn pinecones into interesting home decor items and whimsical ornaments.